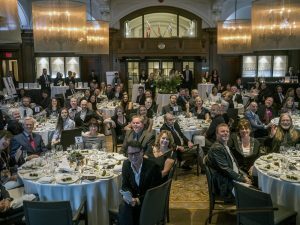 On Thursday, November 16, 118 guests turned out in support of the 4th Annual Chef’s Charity Dinner at the Vancouver Club and raised $46,765 for Dan’s Legacy. The funds will go towards the charity’s counselling and life-skills programs for youth affected by trauma-based mental health and addictions challenges. The inimitable Fred Lee was on hand once again to serve as the evening’s MC, which featured the delightful culinary creations of Chefs Sean Cousins (Vancouver Club), Dr. Theresa Nicassio (YUM), Dino Renaerts (Bon Vivant Group), Shay Kelly (The Caterer) and Saskia Nollen (Vancouver Club). Special guests included: BC’s Representative for Children and Youth Bernard Richard; former BC Finance Minister Carole Taylor; Jan Grude, President and CEO of Pacific Blue Cross; and Brenden Graham from Coast Capital Savings. The charity also launched its film “Passages”, which tells the stories of three young people whose lives were helped immeasurably thanks to Dan’s Legacy’s therapeutic counselling and life-skills programs. Dan’s Legacy would like to recognize its gala sponsors Miss604, Experience Delta Magazine, UA Local 170 Plumbers & Pipefitters Union, Purdys, Indigenous World Wines, Nootka Marine Adventures, the Air Canada Foundation, Holland America Line, and the Vancouver Fire Fighters Charitable Society. Heartfelt thanks also goes to Pacific Blue Cross, Coast Capital Savings, Surrey Cares, the Young Foundation, the Loyal Protestant Association and 100 Men Who Care for program funding. Dan’s Legacy also recognizes and salutes its volunteers for the gift of their valuable time. If you missed the gala but would like to support Dan’s Legacy, or if you know someone battling mental health and addictions issues who is asking for help, please contact Tom Littlewood (Program Director) at 604-999-9136 or tom@danslegacy.com or Barbara Coates (Executive Director) at 604-329-9186, or barb@danslegacy.com.